We believe that education is the foundation for a better future and that hope and equal opportunities should be given to all children. The Burundi Education Fund, Inc. supports Burundi school children (wherever they are) independent of gender, religion, ethnic group/tribe, country of origin, or political affiliation of parents. We believe in hope and equal opportunities to basic education for all children. Without education, the children of Burundi suffer an inevitable heritage that dictates a vicious cycle of poverty and civil war. The Burundi Education Fund, Inc. wants to give these young people a chance to grow, learn, and create lasting opportunities for change not only in small villages, but also for their country. See how donating even a small amount can change the course of history for a child or family. 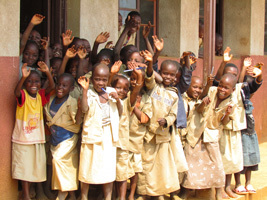 The Burundi Education Fund, Inc. is based on Christian principles and values. We believe and support the legacy of missionaries who introduced and have sustained formal education in Burundi since the 1900’s. Our faith-based educational institutions are dedicated to educating all young people. No child seeking an education should be turned away. We believe that education is the foundation for a better future and that hope and equal opportunities should be given to all children. The Burundi Education Fund, Inc. is a charitable organization that provides materials and financial support to extremely poor Burundi students and their schools. Our primary goal is to help children remain in school and eventually become self-reliant adults, leading to a break in the cycle of excessive poverty in their families.